Your black box and textile bag are collected every 2 weeks and must be at the kerbside by 6:30am on the morning of your collection day. How do I use my black box and textile bag? The black box is provided to help you recycle glass, small electrical items and household batteries. The black box is sorted at the kerbside by the collection crew. What can I put in my black box? 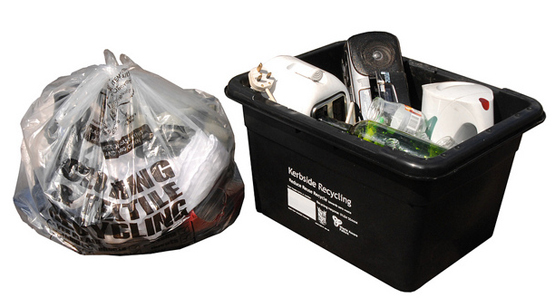 Collection crews are not required to collect electrical items larger than the size of the black box. Larger electrical items can be taken to one of our recycling centres. If your black box contains the wrong material we will advise you by placing a sticker on it. Materials that cannot be recycled in the black box should be taken to one of the recycling centres or put in your green bin. What can I put in my textile bag? Please ensure that all textile items are dry, shoes are tied into pairs and that a knot is tied in the top of the bag to keep the textiles dry.